1. What are the differences and benefits between Plexiglass and Fabric (Lycra) facades? FABRIC - Light weight, cost effective, easy to maintain. The Fabric is removable, washable or replaceable. PLEXI - Hard surface, opaque (non-sheer), easy to wipe down & clean. The PLEXI hides the lighting source better due to its Milky white, thick material. Both look great with LED Lighting. It is a matter of personal taste & budget. 2. Can you add a Logo or graphic to my façade? Yes, we can customize 1 or all of the panels with your logo. This graphic would have to be placed on a PLEXI panel (however, the rest of the facade's panels can stay Fabric). We would need your graphic in a high-resolution format. 3. Are your facades portable? 4. How do the façade panels connect and disconnect? The panels connect with a slip hinge (male-female connector). This allows you to add or take away panels as you see fit. 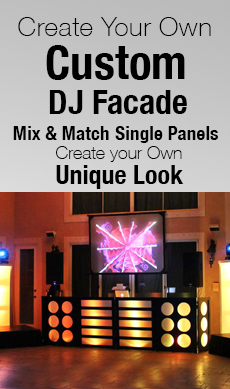 This also provides the added bonus of mixing & matching different sized panels, different designs or the LOGO panel. 5. Can you custom manufacture products to my specifications? Dragon Frontboards is proudly made in the USA (South Florida). Since we manufacture everything on site, we can customize any of our products to fit your specifications, be it the color, dimension or a completely customized piece. 6. Is lighting included with my purchase? Lighting is NOT included with the order of our facades. It seems that every DJ likes to use different quantity/quality of lighting, but we are able to recommend brands / models that are known to work well with our products. 7. What kind of lighting is recommended to use with my façade or workstation? 8. How do I clean my façade? The Fabric is a 4-way stretch Lycra/Spandex. Should you get a small spot on the fabric, you can use a tide stick without removing the fabric. If it is a larger stain, you can easily remove the fabric, machine wash and easily reinsert the clean piece. 9. How do I replace my façade’s Lycra fabric? The fabric is held in place in a similar manner as a screen door. It has a ridge opening (on the back side of the panel) with a spline (rope) that holds the fabric taught in place. Due to the Fabric being a 4 way stretch fabric, it does not easily rip. Should the situation arise where the fabric does in fact rip, you can contact us for a Fabric replacement kit. This is a VERY simple process with a tutorial on how to replace the fabric yourself. 10. Is a carry case included with my purchase? 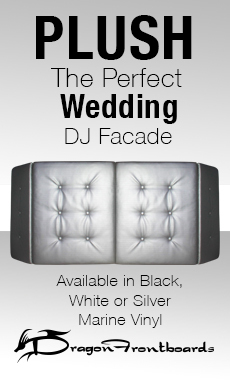 The soft carry case is not included with your order of our facades. However, we can customize a soft carry case for whatever product you are interested in. Some products may require a Hard Case. 11. Can I project photo or video to my façade? 12. Can I use a Flatscreen TV with my façade? We offer a great and unique product called DRAGLORD facade. This has a custom opening for your Flatscreen TV. Starting from 32" and can go to a 60" TV, this opening allows you to insert your TV right into the frame. The TV has a shelf and a holster in the back, securing the TV into place. 13. What other uses does my façade have? With our products, you will have endless possibilities. 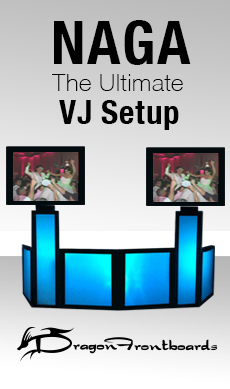 You can mix and match designs for a larger setup, you can add the DRAGLORD (front panel) to utilize your TV, you can project a GOBO or projected image AND you can add a counter top to create a cool and unique GLOW bar. 14. Which facades can I add a countertop to? Our counter tops are usually meant for any 4 panel facade (2 large panels, 2 small panels). You can choose a solid (rectangular) counter top (77" wide x 24" deep) or a "U" shaped counter top (for more accessibility). Additionally, we can make a counter top for any custom item or workstation. 15. What else do I need to know before making a purchasing decision? You need to know that at Dragon Frontboards, we stand behind our products 100%. We strive for 100% customer satisfaction and customer service is our #1 priority. We enjoy making a personal connection with our customer(s). This allows us to get to know you and your specific business needs, allowing us to pinpoint/direct you around the product that would be best suited for you. 16. How do I know that my order went through and determine my shipping date? Once you place your order (online or over the phone), we will email you a PAID IN FULL invoice. Once the order is ready to ship, we will email you a tracking # with a tentative delivery date.